You’re standing in the middle of a playground, watching two children on a seesaw. One is young, a little small for his age, while the other is two years older and a little heavy set. The moment they get on the seesaw…nothing happens, right? One kid is stuck on the ground and the other is stuck flailing in the air, and no matter how hard they try fix the situation, it’s never going to work properly. 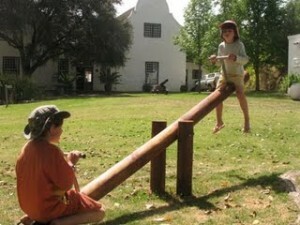 What the seesaw – and every good relationship – needs is a little bit of balance. There’s a lot of conflicting information out there on power in relationships. Do men like it when women make the first move? Are they threatened by it? Are women supposed to be shy and submissive when they’re with a man? Let’s take a moment to look at how courtship works in nature. Amongst animals, men are the pursuers and women are the selectors. Males have eye-catching characteristics, like the lion’s mane or the peacock’s tail, and perform complicated rituals to highlight their best qualities. All this is done to attract a female mate. Males can mate often, but females can only mate infrequently to allow time for pregnancy and caring for their young. Therefore, the female must be extremely selective about who she chooses to mate with. Human attraction, evolved though we may be, works in much the same way. Women are attracted to men who exhibit characteristics of the “alpha male.” That doesn’t mean that they’re controlling – just that they’re confident, optimistic, extroverted, goal-oriented, passionate, dominant when they need to be, and protective. This kind of man understands how to pursue a woman, and prefers to lead a relationship (though keep in mind that this must be done without being overbearing, or the relationship still won’t work…he’ll be the big kid weighing down the seesaw!). Men prefer to be with a woman who doesn’t feel the need to control everything in her life – and that includes him! Don’t get me wrong…once you’re in a relationship, men love it when a woman makes the first move. It makes the man feel wanted, and allows him to be more confident and express himself more frequently as the relationship progresses. And it’s just plain exciting! Don’t allow yourself to be so weak and submissive that you’re the little kid stuck in the air on the seesaw. But during the dating process, hold off a little bit. It can be hard to do, but the long-term benefits are numerous. Allow him to be the pursuer. Let him call you. Don’t always try to decide where to go, what to eat, what to wear. Eventually, you’ll lose respect for a man that you think is unable to take initiative or make a decision. That doesn’t seem like the kind of alpha male that will be able to take care of you for the rest of your life, does it? My relationship advice is allowing yourself to be pursued doesn’t mean you’re weak or old-fashioned – it means that you’re smart and savvy. You’re a girl who knows how to use nature’s precedent to your advantage! Live The Single Life And Love It!